Discount cruise line easyCruise with rates as low as £9 per person per night is including St. Kitts and Nevis on its Caribbean cruise itinerary for the 2006/2007 cruise season. Now in its second season, easyCruise's itinerary allows cruisers to sample both the day and the night life in the various ports of call. For more information about easyCruise second season in the Caribbean visit http://info.easycruise.com/gb/splash/Caribbean0607.html. More information is also available in the press release below. BASSETERRE, ST. KITTS, AUGUST 27TH 2006 - Cruise liner, easyCruise, which is getting rave reviews from budget-minded 20 and 30 something’s and is charting a new course through the canals of Holland and Belgium, is adding St. Kitts and Nevis to its new schedule of Caribbean sailings during the upcoming Cruise ship Season. easyCruiseOne, is currently sailing the French and Italian Rivieras and will make a transatlantic crossing later this year in time for a new schedule of Caribbean sailings. easyCruiseTwo is sporting a new look along with the new itinerary; out with the traffic cone color and in with battleship grey. Starting December 8th, easyCruiseOne will visit the islands of St. Maarten, St. Bart’s Anguilla, St. Kitts and Nevis and Antigua. The ship will spend three weeks being renovated before it heads to the Caribbean. It will be refitted with a new cafe, bar and restaurant, and windows will be added to nearly sixty cabins. 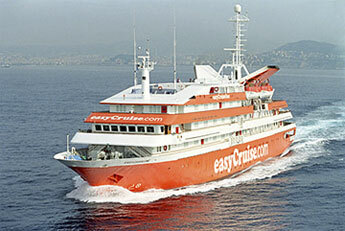 The loosey goosey easyCruise is more like a floating hotel, minimising time at sea so passengers can party in port. Additionally, guests can choose to embark and disembark at any port, as long as they stay for two nights. easyCruise plans to expand its concept to hot spots such as the Greek Islands, Florida and the Bahamas, with two bigger, better ships.